A new 10 meter diameter telescope is being constructed for deployment at the NSF South Pole research station. The telescope is designed for conducting large-area millimeter and sub-millimeter wave surveys of faint, low contrast emission, as required to map primary and secondary anisotropies in the cosmic microwave background. To achieve the required sensitivity and resolution, the telescope design employs an off-axis primary with a 10 m diameter clear aperture. The full aperture and the associated optics will have a combined surface accuracy of better than 20 microns rms to allow precision operation in the submillimeter atmospheric windows. The telescope will be surrounded with a large reflecting ground screen to reduce sensitivity to thermal emission from the ground and local interference. The optics of the telescope will support a square degree field of view at 2mm wavelength and will feed a new 1000-element micro-lithographed planar bolometric array with superconducting transition-edge sensors and frequency-multiplexed readouts. The first key project will be to conduct a survey over ~ 4000 square degrees for galaxy clusters using the Sunyaev-Zel'dovich Effect. This survey should find many thousands of clusters with a mass selection criteria that is remarkably uniform with redshift. Armed with redshifts obtained from optical and infrared follow-up observations, it is expected that the survey will enable significant constraints to be placed on the equation of state of the dark energy. Remarkable progress has been made in the characterization of the cosmic microwave background radiation (CMB) over the last several years. It was nearly 30 years after the initial discovery of the CMB by Penzias and Wilson in 1965 before small differences in its intensity were measured by COBE and its spectrum was shown to be a blackbody to high precision. The remarkable isotropy, precise to a part in 105, helped motivate the inflation theory for the origin of the universe. In the past few years, subsequent measurements of the first acoustic peak and its harmonics in the angular power spectrum provided further support for inflation by demonstrating that the universe is spatially flat. They also allowed a full accounting for the matter-energy densities of the universe, finding in agreement with the analysis of Type 1a supernovae observations that the universe is now dominated by some sort of "dark energy" that apparently is causing the expansion of the universe to accelerate. More recently the WMAP satellite has produced spectacular all sky maps of the temperature anisotropy yielding a highly precise measurement of the angular power spectrum up to multipoles of l ~ 600, corresponding to an angular scale of ~ 20'. The WMAP data, especially combined with finer angular scale CMB anisotropy measurements made with ACBAR and CBI and with other probes of large scale structure have provided a high degree of confidence in the now standard cosmological model and allowed tight constraints to be placed on many of its parameters. While these measurements have led to rapid progress in our understanding of the universe, they have raised even more profound questions about the nature of dark energy and of the possibility of directly testing inflation and determining its energy scale. Remarkably, these questions can be addressed through future measurements of the CMB temperature anisotropy on fine angular scales and of the CMB polarization anisotropy on all angular scales; they form the basis of the scientific case for the South Pole Telescope (SPT) program. Finer angular scale temperature anisotropy measurements are needed to precisely measure the angular power spectrum through the damping tail. Such observations will lead to better parameter constraints and in particular allow a better characterization of the underlying primordial matter power spectrum, that in principle can be used to constrain inflationary models. On angular scales of a few arcminutes and smaller, i.e., multipoles exceeding ~ 2000, the CMB anisotropy is dominated by secondary effects caused by distortions of the CMB as it passes through the universe. The largest such effect is the Sunyaev-Zel'dovich Effect (SZE), in which the CMB photons are inverse Compton scattered by the hot intracluster gas of galaxy clusters. The SZE is a potentially powerful probe of cosmology. Perhaps its most powerful use will be to enable large area, redshift independent surveys for galaxy clusters. As the growth of massive clusters is critically dependent on the underlying cosmology, the yields from such surveys can be used to set tight constraints on cosmological parameters and to investigate the nature of dark energy, i.e., by determining its equation of state. Measurements of the polarization of the CMB are extremely challenging, but also have enormous potential for discovery. The intrinsic polarization of the CMB reflects the local radiation field anisotropy, specifically the local quadrupole moment of the incident radiation field, at the surface of last scattering 14 billion years ago. The dominant contribution is due to Doppler shifted radiation fields arising from the acoustic oscillations at the time of last scattering. This causes the so called E-mode polarization (curl free polarization patterns on the sky) and has been detected by DASI, while the temperature-polarization cross power spectrum (TE) has been detected by DASI and WMAP. However, if inflation occurred in the early universe at a high-enough energy scale, a portion of the local quadrupole at last scattering will be due to primordial gravitational waves created during the inflationary epoch. The inflationary gravitational waves will cause both E-mode and B-mode (curl component) polarization patterns in the CMB. While the B-mode pattern can be distinguished from the intrinsic E-mode pattern, the gravitational lensing of the CMB by large scale structure in the universe will create B-mode polarization from the intrinsic E-mode signal at a level that is higher than the inflationary B-modes for all but the most optimistic inflationary models. In this case, the only hope in recovering the inflationary B-modes from the lensing B-mode foreground lies in exploiting the different angular power spectra and their correlations with the temperature and E-mode spectra. The lensing polarization signal is also interesting in its own right as it can be used to trace the growth of large scale structure which in turn is sensitive to the mass of the neutrino and the equation of state of the dark energy. The South Pole Telescope (SPT) is being designed to pursue the next generation CMB temperature and polarization studies at the exceptional South Pole site. 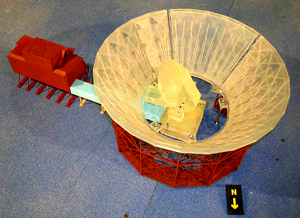 The telescope is designed explicitly for conducting large area, high sensitivity survey observations of the temperature and polarization of the CMB. The SPT has an off-axis 10 meter diameter aperture to provide 1' resolution at 2mm wavelength with exceptionally low spillover. The optics will support a one degree diameter field of view. To further reduce signals due to scattering and spillover, the entire telescope will be deployed within a large reflecting ground screen. Deployment is planned for late 2006, with first observations starting early 2007. State of the art bolometer detectors used for ground-based CMB observations are essentially background limited. In this case, the obvious path to higher sensitivity is to add more detectors. 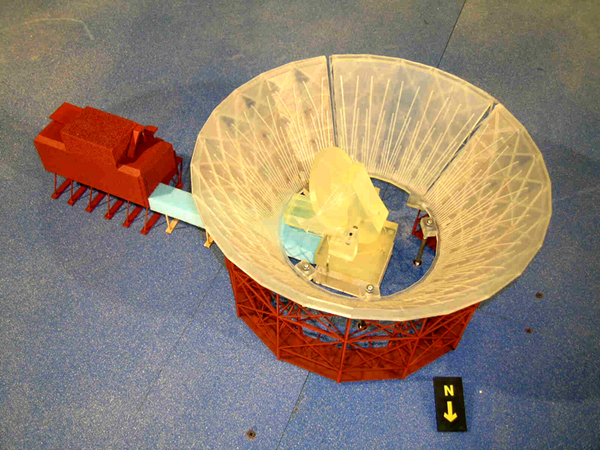 The initial SPT receiver will be dedicated for fine angular scale CMB temperature and SZE survey observations. It will consist of an array of 1000 micro-lithographed bolometers with transition edge sensors (TES) read out with a novel frequency multiplexing scheme. While a polarization sensitive receiver is planned, only technology development funds have been obtained for it at this time.